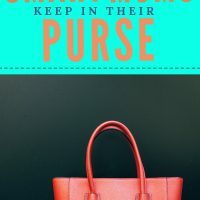 As moms, we have to be prepared at all times and that means keeping your handbag stocked. But none of us wants to feel like a pack mule. So—what are the mom purse essentials? If you are out of the diaper bag stage, you may feel a tinge of excitement to once again, carry a stylish handbag. I hope your definition of stylish is BIG because you still need to lug around a whole lot of stuff. When the twins were babies, the diaper bag did double duty as my purse and baby bag. When they got bigger and I needed a bag to carry toddler stuff, I still needed a really big bag to carry a ridiculous amount of stuff. It’s seriously like a cross-fit workout to carry my mom purse. To cut down on the handbag clutter, I keep my car organized and stocked with things we may need while out and about. 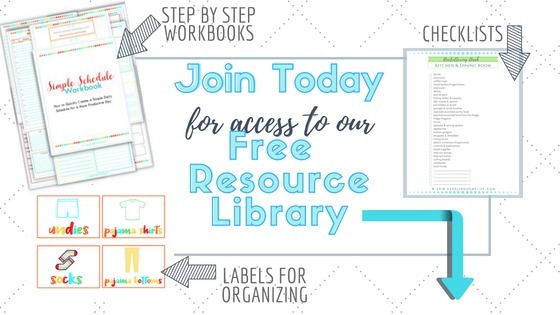 Be sure to read 12 Essential Items Moms Should Keep in the Car to get you mom car organized and prepared for all the things your kids may need while out and about. Is there a Perfect Mom Purse? But, I do have some qualifications that a bag must meet to be my mommy tote. First of all, it has to be reasonably priced. I want the most durable handbag I can find with a moderate price tag. Second, it must not be floppy. At attention little handbag. Next, it can’t be ugly. Also, it has to have good straps and some kind of pockets inside. Almost as important as the handbag you choose are the small bags you will use to organize your mom purse must haves. I prefer the clear zippered bags/pouches so I can easily see what’s inside. The black pouch holds my make up and has a mirror on the inside flap. I picked it up at Tuesday Morning but this makeup bag is similar. 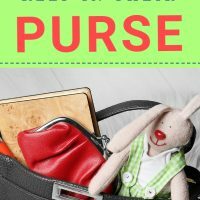 What are the Mom Purse Essentials? I can’t even remember how I functioned without my smart phone. It has my coupons, driving directions, grocery list, serves as a flashlight, provides entertainment for the boys when an appointment is taking forever—there’s not much our phones can’t do. I never leave the house without it and I learned the hard way to keep it in an Otter Box. My wallet is actually a roomy wallet/purse with a detachable crossbody strap (similar to this wallet). I remove the strap and use it as a wallet inside my purse. This is where I keep all the cards I might need (Driver’s License, Health Insurance, Debit Card, etc). I also keep some cash and some quarters on hand as well. You never know when you will need coins to air up a tire or cash to use for a toll road or an impromptu snow cone stand. 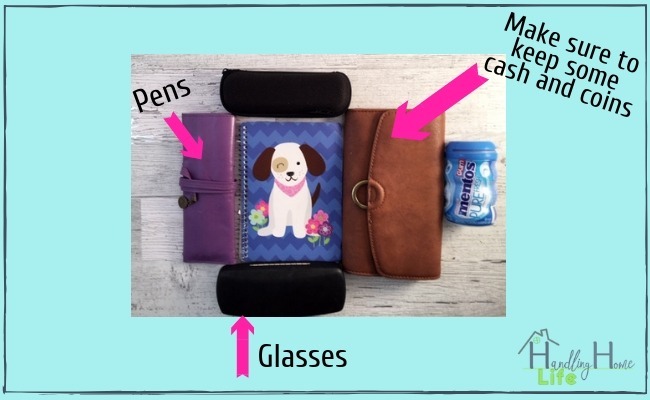 I always carry some type of notebook and pens in my handbag. These pens are my all time favorite. I know many people make lists or take notes on their smart phone, but I like the physical act of writing. I use my notepad to jot down ideas while waiting at Gavin’s tennis lessons, to take notes at a doctor appointment, or to take notes at church. It also comes in handy to give the twins paper to draw on if they are getting antsy while waiting at an appointment. I keep my pens in a cute little roll like this one. Definitely must have my shades. I get the worst headaches from bright lights or glares. My sunglasses are nothing fancy—that way I’m not sad when I break or lose them. I don’t go anywhere without gum and this is my favorite right now. I love the Wisp disposable mini toothbrushes for when gum just won’t cut it. They are so handy for busy moms always on the go. I buy a box of the antibacterial wipes that are individually wrapped and they last forever. I toss one in each zippered pouch for just in case. We don’t use antibacterial all the time, but there are occasions when it is necessary. 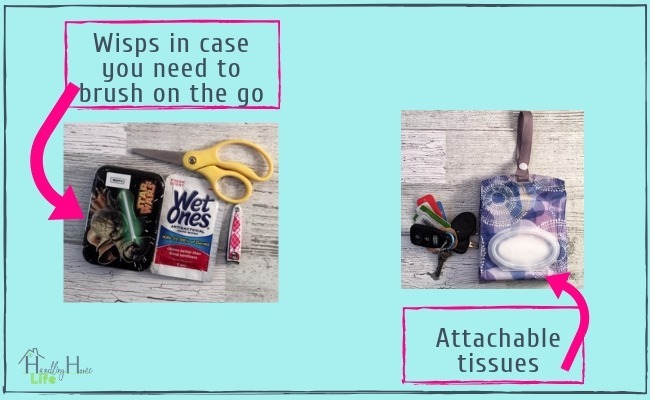 Wet wipes are a life saver and a very important part of your mom purse survival kit! The Kleenex Wet Wipes are my current favorite since they have no harsh chemicals and are hypoallergenic. Tissues—lots and lots of tissues. I love the little purse pack of tissues that have the strap that snaps right onto your bag strap. A small pair of kid scissors can be very useful for all kinds of things. I cut straws to fit small cups for the boys, snip stray threads, or remove tags from clothing. I also carry nail clippers which could handle most of these same tasks. Alcohol free hand sanitizer is definitely part of my mom purse essentials. Killing icky germs makes me happy. And fragrance free is necessary because Beckem is extremely sensitive to smells. 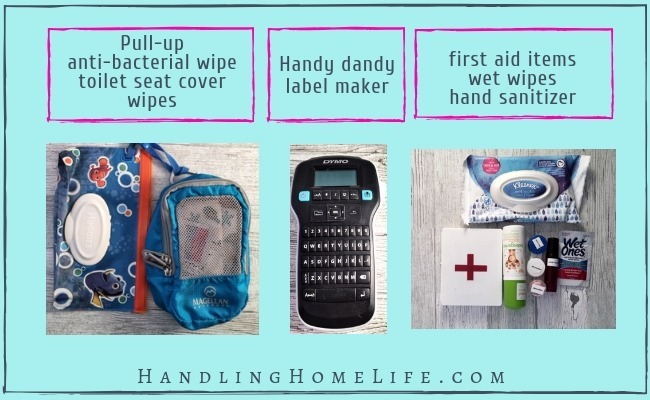 Some simple first aid supplies should suffice in your mom purse. I keep a more thorough first aid kit in my car, so the bare minimum lives in my purse. I keep some bandages for cuts or scrapes, hand sanitizer, wipes, ointments, heartburn medicine, and essential oils. A contact lens case works perfectly to put antibiotic ointment in one side and anti itch cream in the other side. I use roller ball bottles to take essential oils on the go. Plant Therapy is my go-to brand and I dilute with organic almond oil. Germ Fighter is an immune system blend that I always keep ready to roll! I usually carry spearmint essential oil as well. It works wonders for car sickness and nausea. Definitely an important part of my mom purse essentials kit. One of the twins, Beckem, has an extremely rare disorder called KAT6A. So even though he just turned 6 years old, he still wears a pull up when we are out. So I keep a pull up, toilet seat cover, small bottle of hand sanitizer, and anti bacterial wipes, in a small packing cube with a package of wet wipes clipped to it for just in case. Then, when I take him for a bathroom break, I just grab the packing cube out of my purse and I have everything I might need. I use these pull-ups that open on the sides so I can easily change him while he’s standing up—without having to remove clothes and shoes. What do I keep inside the makeup bag? If a messy bun/pony tail is your signature look too, then make sure to keep hair ties with you. I think I’ve tried just about every single hair tie out there and am always looking for a better version of this seemingly simple hair tool. Why in the world is it so difficult to find a hair band that doesn’t either pull your hair out or slip down to give you a sideways ponytail? When I stumbled upon these hair ties recently, I had very little hope that they would be anything more than a let down like all the others. It looks like an old school phone cord for crying out loud! Let me say without exaggeration…these hair tie thingies are life changing. They don’t slip at all so I don’t have to redo my mom bun a thousand times a day. I don’t have a headache or a big crease in my hair from a hair band that’s too tight. Ready to let your hair down? These things don’t get stuck so no breakage or hair loss! I carry several because you never know when you might need to help a sister out. I gave one away just yesterday to the sweet gal at the register. We were talking about the muggy weather and she said it was a bad day to forget her hair tie since the humidity makes her hair go crazy. 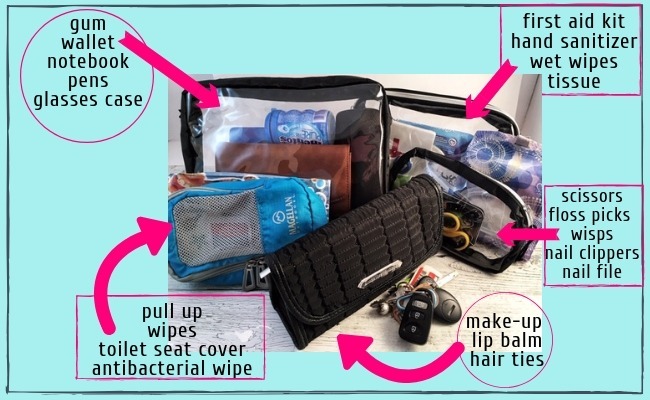 Organized mom purse to the rescue!! I whipped out a hair tie and turned her bad hair day around! I really like Aquaphor for chapped lips, but the twins can’t stand how it feels. I use the Burt’s Bees lip balm but they don’t like the tingly of the peppermint. (so high maintenance!) So, I finally found this organic lip balm that they both like—phew! I like this roll on fragrance from Pacifica. The scent doesn’t last very long, but it’s the only thing I have found that doesn’t bother my allergies and sensitive skin. There are many times that I do my makeup while waiting in the car so I keep the basics in my purse makeup bag. I don’t take the snack bag every time—only when going to things like appointments or the park. I use a zippered pouch that hangs on a hook with lunch boxes so I can easily grab the bag of snacks when needed. 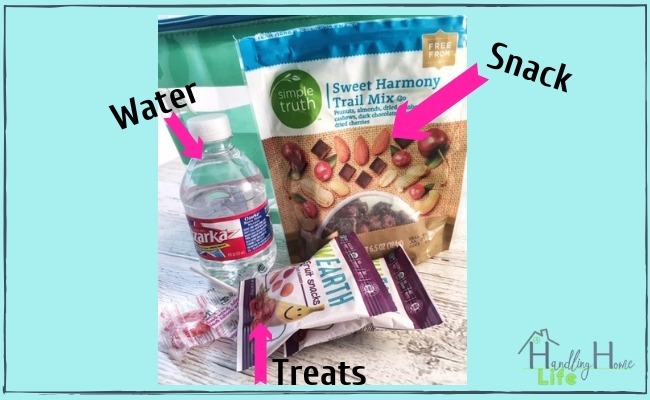 The mini water bottles fit nicely and I usually include some type of trail mix as the snack—along with some kind of treats for bribery. I almost forgot to mention my label maker! It’s not part of my mom purse essentials, but it comes in super handy for labeling things like my essential oil roller bottles, ointments and such. 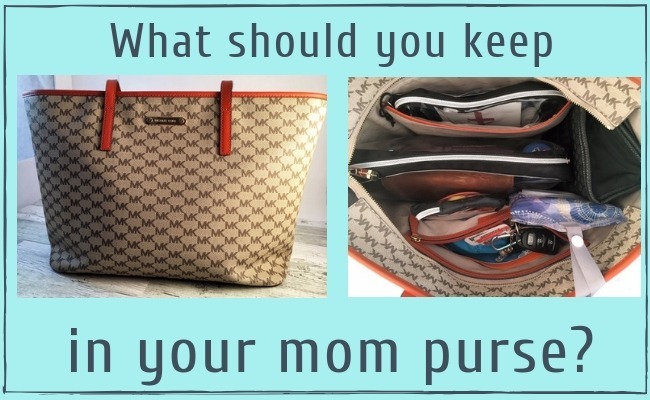 So what are your mom purse essentials?